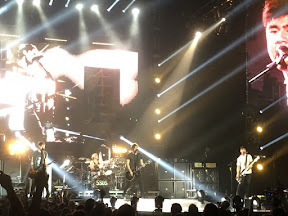 GUITARS, Drums and screams burst from the roof of the Glasgow SSE Hydro as 5 Seconds of Summer took to the stage. The smell of freshly shampooed hair whipped everyones nostrils and shoulders as teenage gals let out their biggest screams and swayed for Calum, Ashton, Luke and Michael. The Aussie lads who are more grimy and stubbly than One Direction who they used to support, were met by a wall of high pitched tonsils as they appeared on stage to play Hey Everybody, their guitars and drum hypnotising their captive crowd. Changing the lyrics of Money, Calum, whose dad is from Edinburgh, sang: "Take my keys for a great night out in Glasgow." After a rousing rendition of Disconnected he and the others took to the mic to have a 'Glasgow off' each taking it in turns to become more Glaswegian. Michael proved to be surprisingly talented when it comes to the Scots tongue . The pacy Don't Stop was met with more lung Splitting and Castaway got everybody oh oh ohing in the right places. Jet Black Heart was a massive singalong while during Beside You everyone wished they were alongside the boys on stage. Luke revealed his favourite song was Vapor, a slower paced anthem which let everyone get some breath for even more screams. They needed them for next number, the epic End Up Here which saw people jumping to the beats as a sweat soaked Ashton encouraged them from his drum kit. The guitars screamed along with the fans for Good Girls and everyone was on a high despite it being a school night. The icing on the cake was when Calum, who admitted he was home from home, played bass in time along to the now well known Glasgow gig chant of here we f***ing go and then ran it straight into the Proclaimers 500 Miles. Permanent Vacation and The Romantics cover What I Like About You followed before the smash She Looks So Perfect. Most of us were a hot mess after if but who cares. This was the start of rock n roll.